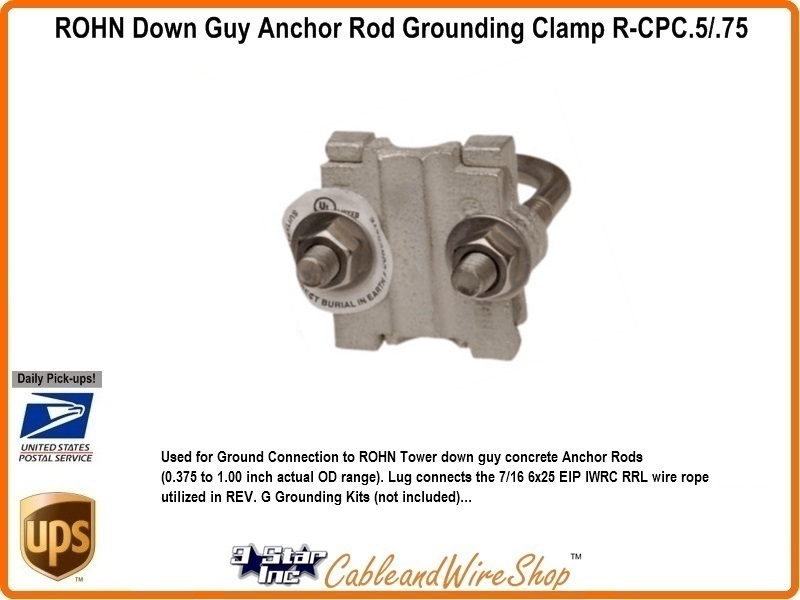 Used for Ground Connection to ROHN Tower Down Guy concrete Anchor Rods (0.375 to 1.00 inch actual OD range). Lug connects the 7/16 6x25 EIP IWRC RRL wire rope utilized in REV. G Grounding Kits (not included). Harger CPC Pipe Ground Clamps compare to Burndy GAR. Note: Made to connect to the Rod Section components of a ROHN Tower Down Guy Anchor as these Rods are within the nominal OD range above. This Clamp will also connect the Solid/Stranded Copper or Woven Rope Ground Wire lead to the Ground Rod on the other end, completing your Grounding (Lightning Protection) System. Typically, 3 (or multiples thereof) of these Clamps are used per Tower Installation as most Systems will dictate that a separate Ground Connection be made to all three Tower Down Guy Anchors. AGK1GGX Grounding Kits do not come with this component unless included in a Complete ROHN Guyed Tower Kit.